I wrote a blog post recently that highlighted how Delve should be the center of your Office 365 universe. In essence, it is a single pane of glass across all your information sources. So instead of digging through your inbox, then documents, then social feeds you go to Delve and everything is presented in an order of its relevance to you automatically. 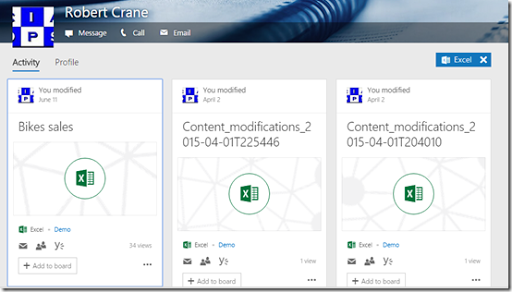 Microsoft has now added a new document type filter button when you visit the Me section of your Delve. When you select the Me link on the left you see your profile as shown above. However if you look on the right hand side you will see a new option I’m looking for. If you select this you’ll be presented with a list of file types as shown above. If for example select Excel then your Delve will be filtered to only show those file types as seen above. 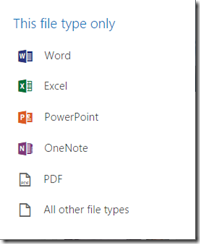 This is a handy way to quickly locate the file type you are working using Delve. This new option is available now available to those on the first release program and will be rolled out to everyone else soon.